Viridis Fuels, a 20 MMgy biodiesel project in Oakland, California, is being awarded a $3.4 million grant to build its project. The company intends to build America's most visible biodiesel plant at the foot of the heavily traveled Bay Bridge. 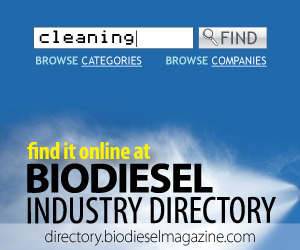 Last week, Renewable Energy Group's renewable diesel plant in Geismar, Louisiana, and Viesel Fuel's biodiesel facility in Stuart, Florida, both suffered devastating fires that are currently under investigation, according to the two companies. In cooperation with biodiesel producer ecoMotion GmbH, Emil Kammerer GmbH provides the following case study for application of its shut-off valves as discharging valves when extracting glycerin from the waste products compound. Tenaska, a leading independent energy company, has acquired the assets of Clinton County Bio Energy in Clinton, Iowa, from a local group of investors. Ocean Park Advisors acted as exclusive financial advisor to CCBE on the sale transaction. Due to legal actions that were concluded in 2013, California Air Resources Board is re-adopting the regulation to address the court's ruling. CARB took this opportunity as a chance to update the regulations and to implement program improvements. In a petition filed March with U.S. EPA, the National Biodiesel Board cited the lack of public comment on the agency's decision and little transparency regarding the plans Argentinian producers can use to demonstrate compliance with the RFS. BDI-BioEnergy International AG reported a decline in revenues of 53.9 percent to 16.3 million euros in the 2014 financial year. The reason for this was the delay in the implementation of two major biodiesel projects in Croatia and the Netherlands. The buyer, Drain Bros., will become the first facility in the world to use Methes' pretreatment system using the PP-MEC catalyst to process corn oil from a local ethanol plant. The company is also buying a Denami 600 biodiesel processor from Methes.